I hate crying almost as much as I hate being labeled as a “female entrepreneur” or a “female investor.” Both of these things make me feel weak and vulnerable, as if I’m somehow not strong enough to play in the major leagues. But if there is one thing I’ve learned on this incredible ride of founding an accelerator for women, it’s this: My female qualities that I’ve taught myself to hate – deep empathy, vulnerability, etc — are an intrinsic part of why my female partners and I were able to pull together an accelerator and an inaugural first class that was seen as top-tier. 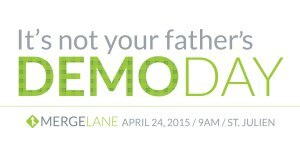 By the end of our first Demo Day, I was so tired, I could barely speak. It was a level of exhaustion I’ve experienced very few times in my life, but it wasn’t because of my lack of sleep. It was because I was emotionally overcome. At least 100 people went out of their way to give MergeLane heartfelt positive feedback. These weren’t just generic congratulations and pats on the back. These were truly moving compliments, nearly every one of which made me teary. By the 99th compliment at 9pm, I was so emotionally exhausted from trying not to cry, I collapsed into bed. When I woke up and started to reflect on all of this, I decided it was time. On the morning after our wildly successful Demo Day, I let myself cry. I cried, and cried and cried because I was so proud of our amazing MergeLane teams, my partners Sue Heilbronner and Hannah Davis, and all of our investors, mentors and sponsors who took this giant leap with us. What a great day! Some highlights for me were…The people! Everyone was so warm, friendly and easy to talk to. I think it’s at least in part because we all felt connected by being part of something wonderful. Being able to bring my daughter Sammy! She’s 15, loved it, and spent dinner tonight quizzing me on what happened in the investor meetings. As my girls grow I’m always thrilled when we develop a new shared interest that allows us to connect in a new way. That happened today. Days like today, the orgs like @Mergelane & @NCWIT, and a community that supports them are why we’re raising our daughter in Boulder. Today was amazing. Loved the creativity, energy and pure fun factor of demo day. It was awesome! And I thought the teams did great. You guys hit this out of the park! The room was electric, the presentations were exceptional, and most importantly the companies have come incredibly far in their 12 weeks being a part of MergeLane. To follow on Sue’s words, I am PROUD to be a MergeLane sponsor. Not only have you made a huge impact on their businesses, but you’ve made a huge impact on these women. They simply look and sound like different people. From the authority in their voice to the way the way they hold themselves in the world, you aren’t just accelerating companies, you are building extraordinary women. Thank you, thank you, thank you to all of you for believing in us, volunteering your time, investing in our teams, sponsoring our efforts and, most importantly, for making me cry.